View the list of deals created for the customer along with stages during the chat. 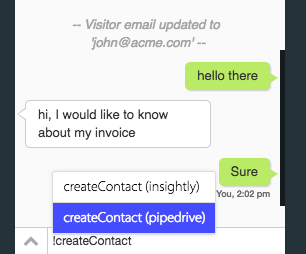 Every chat conversation with a new customer will be added as a contact on your Pipedrive account. Contact will have customers' name, email id and phone number. 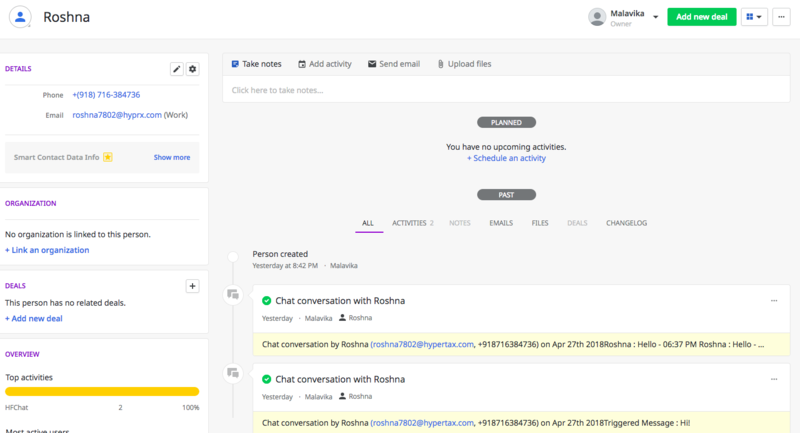 Every chat conversation will be added as an activity under respective Pipedrive contacts. View visitor information on the chat window. 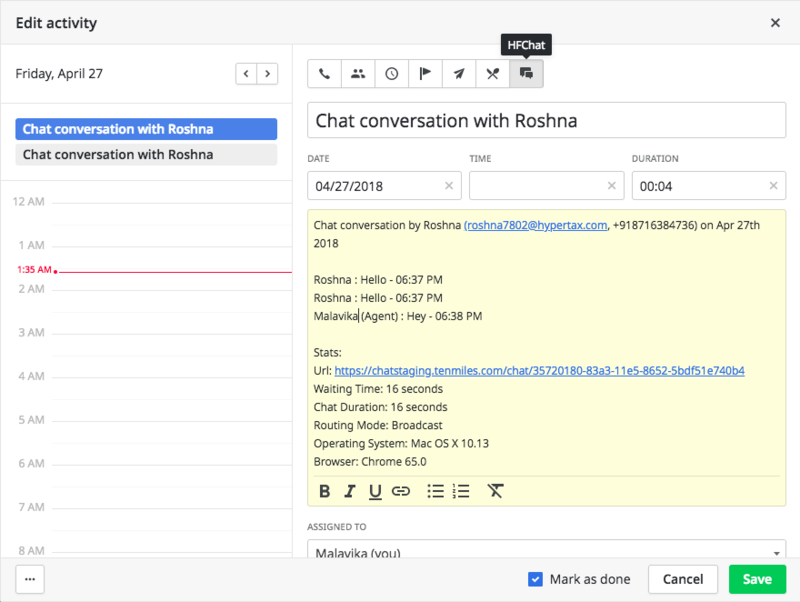 Create a contact from the chat window. Only Admin has the access to Integrate Pipedrive with HappyFox Chat. This integrations is available in Mighty plan and above. 1. Log in to your Pipedrive account. 2. Go to Settings tab → Select API → Copy the API Key. Step 1: Login to your HappyFox Chat account. Step 2: Go to Apps → Pipedrive. Step 3: Click on INSTALL button. 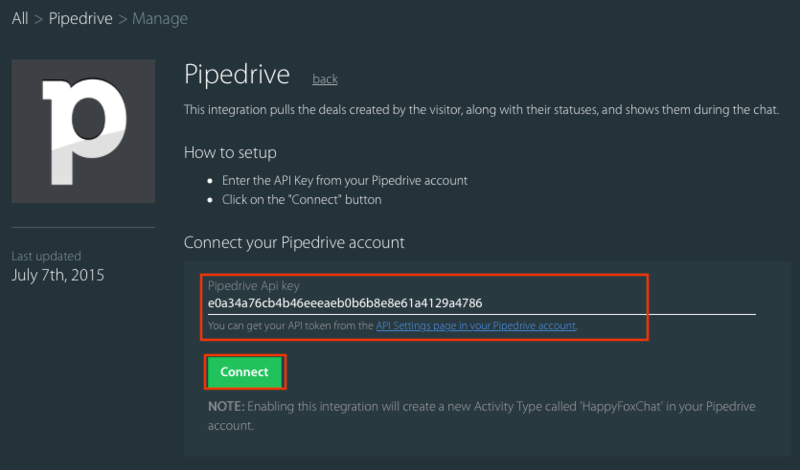 Step 4: Enter your Pipedrive account's API key → Click Connect button. Step 5: Set your preferences under Settings → Click Update settings button. 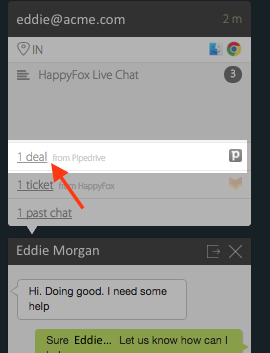 You have now integrated Pipedrive and HappyFox Chat accounts successfully. After chat conversation with new customer their details will be added to Pipedrive as contact. 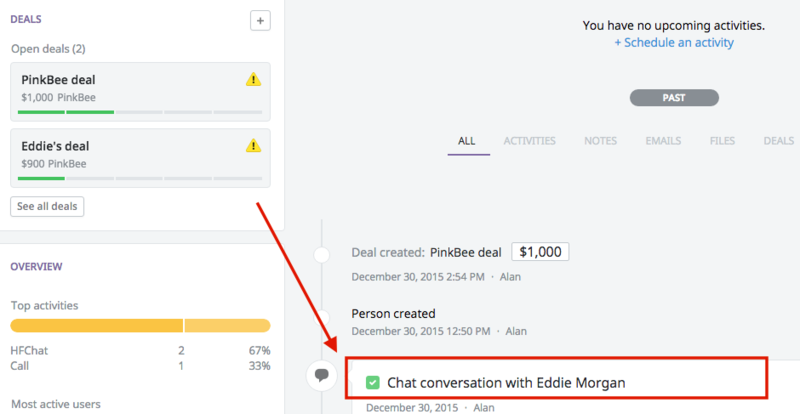 On Pipedrive, at the end of each chat conversation, an activity is added to each contact. You can mark the activity as "HFChat" type. 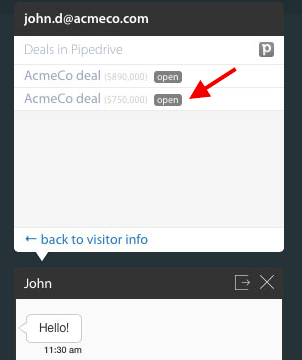 Now, you can see the visitor's deal from Pipedrive in the chat screen. Note: To refresh the customer information area, simply type '!' and choose !refreshvisitordata. 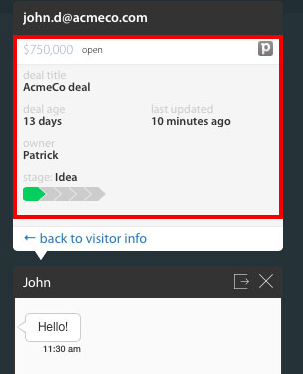 When agent clicks on a deal, details of the deal will be displayed along with the stage of the deal. On clicking the Chat conversation link, you will be taken to "HappyFox Chat" activity type. Step 1 : You can turn on the setting - "Enable chat command to create contact" under settings. 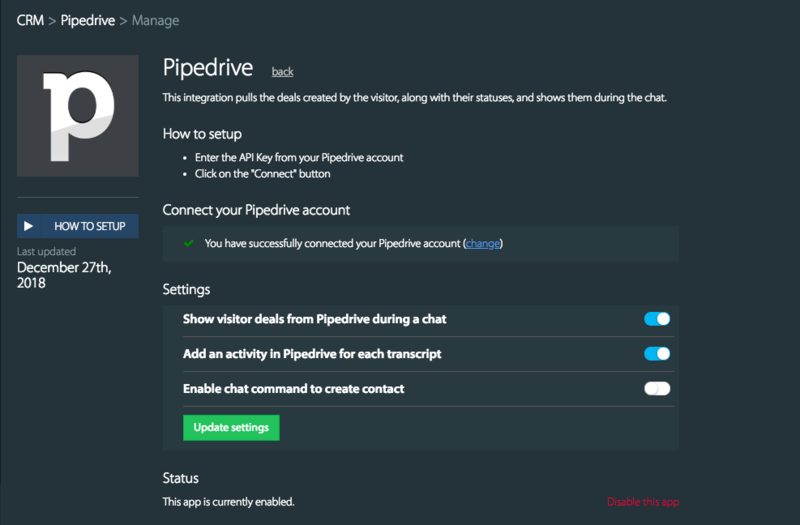 Step 2:During an ongoing chat, if you wish to create a contact on pipedrive, you can simply use the chat command - !createContact (pipedrive). A contact would be created with the visitor's name and email id. HappyFox Chat integration with Pipedrive keeps you updated with your visitor deals and its statuses for faster chat resolutions.